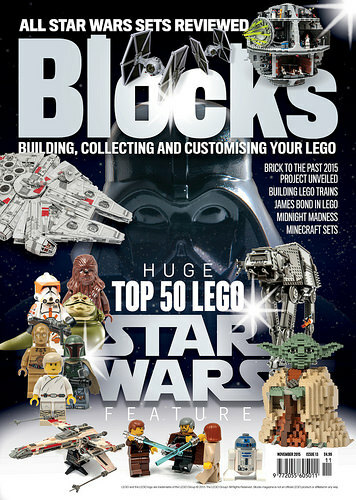 As if the current wave of Star Wars mania wasn’t enough, this month the LEGO force really does awaken in issue 13 of Blocks magazine, available in UK stores October 22nd. The issue features reviews of the hotly anticipated new Star Wars set lineup, as well as a mammoth special feature exploring the top 50 Star Wars LEGO moments, from sets, to MOCs, brickfilms, photography, and much more. Issue 13 also celebrates the upcoming release of Spectre with some exclusive James Bond themed creations built exclusively for Blocks, takes a look at The Walking Dead in LEGO form, investigates Minecraft, LEGO train building, and Ma.Ktoberfest. All topped off with an exclusive reveal feature of Brick To The Past‘s stunning 2015 historic collaborative LEGO build The Wall.